INA ROAD AT SR-77 INTERSECTION IMPROVEMENT - KE&G Construction, Inc.
KE&G working for the Pima County Department of Transportation in conjunction with the Regional Transportation Authority, Town of Oro Valley, and Arizona Department of Transportation; the Ina Road at SR77 (Oracle Road) project is nearing completion. This will be the first ever indirect left intersection to be constructed in the state of Arizona. 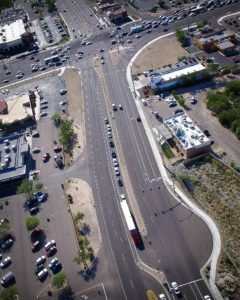 This intersection is the second busiest intersection in Pima County, with over 96,000 vehicles passing through it daily. This improvement project was designed to increase the capacity at the intersection by eliminating the designated left turn signal time onto Oracle Road and the addition of dual right turn lanes onto Oracle Road northbound. It has been evident over the past few weeks how much the new traffic configuration has improved the general flow of traffic, decreased traveling delays, decreased west bound traffic congestion on Ina Road and decreased traffic cutting through neighborhoods adjacent to the intersection. The project includes the installation of over 1,500 LF of storm drain, 15 new storm drain structures, 9,875 CY of roadway excavation, over 3,900 TONS of asphalt paving, a new bus pullout, two new indirect left turn intersection, the reconstruction of the Ina Road/SR77 intersection signals, 6,100 LF of concrete curb, over 480 CY of hand placed rip rap, and 8,200 SF of decorative concrete pavers. The majority of this project was constructed at night, with working hours from 8:00 p.m. to 5:00 a.m., there was a tight 60 working day schedule as well. However, even with 16 utility delays, 161 force account items, and 39 requests for information, this job is still scheduled to finish within the allotted contract time.